From 20-year-olds with limited experience of professional events to the likes of former Open runner-up Ian Poulter, those who make it through Open Final Qualifying represent a full spectrum of golf at the elite level. The Open Championship is as it’s named – open. Although it’s perhaps more challenging than ever before to earn a place in golf’s most prestigious individual event, it is still possible for professional or amateur players with a handicap of scratch or better. If you fall into either of those categories you can enter Regional Qualifying with a view to making it on to Final Qualifying and then, perhaps The Open itself. The 15 players who made it through Final Qualifying for The Open Championship this year demonstrate the diversity of the great event. The qualifiers include: amateurs, veterans, representatives from the minor tours and players who have competed at the very highest level. Connor Syme – The 22-year-old amateur from Drumoig in Fife has enjoyed a successful amateur career at both boys’ and senior level. He has won a number of individual events and helped Scotland retain their European Amateur Team title in 2016. Julian Suri – An American professional, the 26-year-old attended Duke University in North Carolina. He’s been playing on the European Challenge Tour this season and he secured victory in the D+D REAL Czech Challenge in May. Haydn McCullen – The 20-year-old from Manchester turned pro in 2015 and he won on the EuroPro Tour in his first season on the circuit. Nicholas McCarthy – Another man who has been plugging away on the EuroPro Tour, the 29-year-old was ready to quit after a poor 2016 and had applied to the PGA to start a three-year instruction course. Adam Hodkinson – A childhood friend of Nick McCarthy, Hodkinson has qualified alongside his pal. He played for England as a junior but suffered a setback with an injury to his arm. He’s been playing EuroPro Tour this year. Mark Foster – The 41-year-old Foster won the English Amateur twice before turning professional in 1995. He’s won three times on the Challenge Tour and once on the European Tour – The 2003 Dunhill Championship. This will be his fourth start in The Open Championship. Joe Dean – The youngster from Yorkshire won the English Amateur Championship in 2015. He’s been playing on the EuroPro Tour for the last couple of seasons and has recorded a number of top-five finishes on the circuit. Laurie Canter – The 27-year-old won the South African Amateur Championship in 2010 and qualified for The Open at St Andrews that year. He has played 33 events on the European Tour. Matthew Southgate – One of the great stories from recent years on the European Tour. He came back after surgery for testicular cancer to make it through all three rounds of European Tour Q school and regain his card for 2016. He finished tied for second in the recent Irish Open and picked up a cheque for €531,000. Robert Dinwiddie – He won the 2005 Scottish and Welsh Amateur strokeplay championships and played in the Walker Cup of 2005. He turned pro in 2006 and enjoyed his best season on the European Tour in 2008 when he finished 72nd on the order of merit. He’s currently 752nd on the Official World Golf Ranking. Austin Connelly – The 20-year-old is a friend of Jordan Spieth and the pair have been practising together at Birkdale. He’s been playing in Canada and in Europe. He’s played six times on the European Tour and was tied eighth in the Nordea Masters in June. Shiv Kapur – The 35-year-old has twice been a winner on the European Challenge Tour and twice on the Asian Tour. He’s been a steady performer around the world and has 10 top-10 finishes on the European Tour to his name. 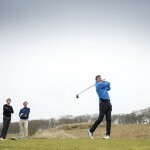 Toby Tree – The 23-year-old from Sussex had a successful amateur career in both boys and men’s golf. He turned pro in 2014 and has played on various tours around the world. Ian Poulter – Doesn’t need too much of an introduction. Poulter has won 12 times on the European Tour and has four further pro titles to his name. The Ryder Cup stalwart was runner-up in The Open last time it was contested at Royal Birkdale in 2008.